This sweet potato fries recipe is a spicier, zestier way to enjoy a plant-based kitchen classic. A drizzle of tahini, a squish of lime and a sprinkle of red pepper flakes make all the difference, taking already fantastic plain sweet potato fries to an even better, more exciting level. Prepare to excite your palate and inspire your senses! Enjoy! Sweet potato is high in vitamin B6 that helps reduce degenerative diseases, is packed with vitamin C and D, helps maintain skin’s youthful elasticity, contributes to healthy bones, heart, nerves, skin, and teeth, supports the thyroid gland, contains iron for white cell production, stress reduction and immune function, works as an anti-stress and relaxing agent due to its magnesium content, regulates heartbeat and nerve signals with potassium, has sugars that are slowly released into the bloodstream and thus don’t cause sugar spikes, and are high in carotenoids and antioxidants to help ward off cancer. Sweet potatoes are truly a life changer when you are trying to fill up and stay satisfied while incorporating more vegetables into the diet. However, don’t stick to the basics each and every time – the sweet potato’s flavor profile is so much more diverse than you think. 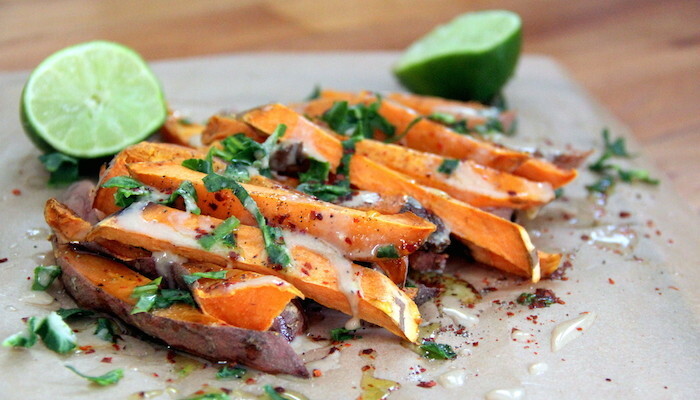 In this sweet potato fries recipe, I balance the inherent sweetness of the potato with a bit of creamy (tahini), sour (lime), savory (salt), and spicy (red pepper) elements. Each flavor ignites your taste buds in a unique way and thus keep you wholly satisfied. I chose to bake these fries without any oil. When oil undergoes heat, its biochemistry changes, making it acidic to the body. Just because an oil isn’t saturated doesn’t mean that it will do you any more favors than, say, regular butter when cooked. That’s why I drizzle the olive oil and tahini atop the fries after they cook. That way, the olive oil and tahini never reach a high enough temperature to destroy. If you are keen on cooking the fries with some kind of fat – stick to plain butter. Simply melt 1-2 tablespoons of butter in a small saucepan and pour the butter over the fries in a bowl and toss until all of the fries are evenly coated. Then you can spread the fries out on the baking dish. Wash the sweet potato, scrubbing off any visible dirt. Slice the sweet potato into fries-like shapes, about 1/4-1/2-inch thick. Place them apart on a parchment-paper lined baking sheet. Put the pan in the oven and cook for about 15 minutes, or until the fries are fork tender. Broil on low for another 5 minutes, or until they become lightly brown and slightly crispy. Transfer the sweet potato fries to a serving dish and drizzle with olive oil and tahini, season with red pepper flakes and salt and pepper and spritz with lime. Enjoy while still warm! If you liked this recipe, you also might be interested in…. 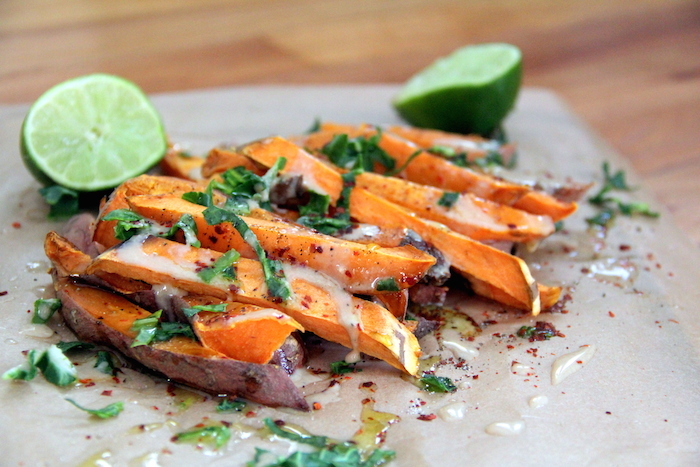 This entry was tagged fries recipe, sweet potato fries, sweet potato recipes, sweet potatoes. Bookmark the permalink. Thanks for this great recipe! I featured this today on my FB site “Super Quick Plant-Based Recipes” https://www.facebook.com/SuperQuickPBRecipes/ I think my group will really like them since they are quick and use few ingredients!